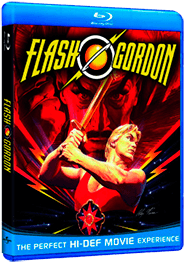 When the totalitarian planet of Mongo decides on a whim to obliterate Earth, it's up to the lunk-headed quarterback Flash Gordon and his oddball companions to make the universe safe for democracy. Based on the classic (and infinitely more reputable) comic strip and its '30s screen serialization, this cotton-candy-colored trash classic deserves immortality for Queen's unforgettably pulsating soundtrack alone. The legendary Max von Sydow appears to be having a blast as the evil Ming the Merciless, while Ornella Muti, as his daughter, is the living embodiment of what attracts adolescent boys to comics in the first place. (She makes Barbarella look mundane.) One of the most shamelessly entertaining movies ever made, this is a knowingly absurd sensory freak-out that'll have the viewer blissfully checking the sky afterward for signs of Hawkmen. • Writing a Classic: Screenwriter Lorenzo Semple, Jr.